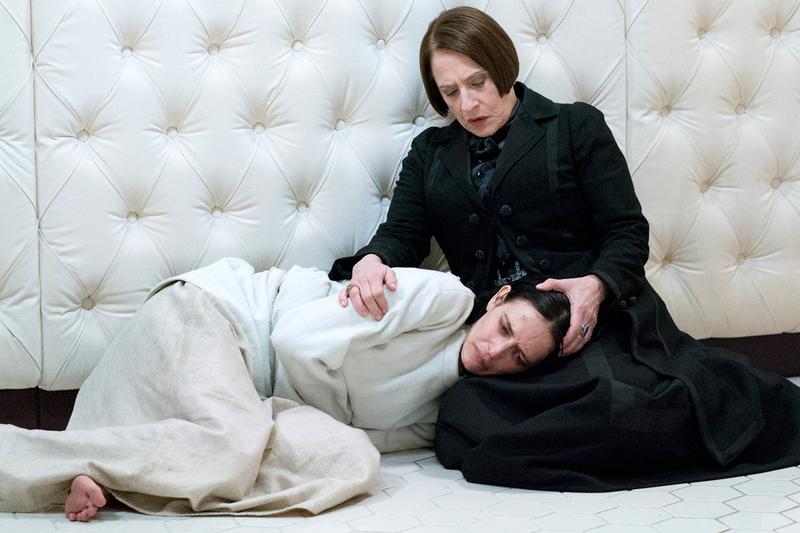 Penny Dreadful: A Truly Dark Universe. Needless to say SPOILERS for Penny Dreadful. There was ample reason for people to feel that way. Not only is Dracula my all time favorite novel, but I am big devotee to Universal’s classic monster movies and their Hammer reincarnations. My home is littered with images of not only Stoker’s infamous Count, but Frankenstein’s Monster, the Wolf Man, and various other monsters. Upon actually watching Penny Dreadful, I found my friends to be quite correct in their assesment, as it was almost instantly my favorite TV show. The subject matter coupled with top notch writing, acting, and production design made it something easy to fall in love with. Throwback horror has rarely faired well in recent years, but Penny Dreadful treated its subject matter respectfully, even when it subverted your expectations. But good things don’t always last. Penny Dreadful was cancelled after a wild, third season. Leaving fans hungry for more. The show’s last episode that while having great moments, didn’t feel complete. Fans tried to rally together and petitioned for Netflix to bring the show back from the dead, but it was not to be. After close to a year, I’ve grown to accept that. So, what was a hopeful fan of classic monsters to do? Well, Universal is launching their own joint film universe. The…wait for it…Dark Universe. Beginning with the upcoming Mummy film starring Tom Cruise, it’s hard to blame Universal studios for wanting to get into the act now perfected by Marvel. They practically invented this gimmick with their gothic horror films of the 30’s and 40’s. Still something feels kind of hollow about their “Dark Universe.” It looks more inspired by Michael Bay than James Whale or Terence Fisher. I hope I’m wrong but in the mean time, let me try to convince you that we already had a great shared universe filled with these classic characters. All three seasons of Penny Dreadful are streaming on Netflix or are available on Blu-Ray. I hope to convince you to give it explore it’s dark corners. If you’re a fan of classic horror, I don’t doubt you’ll find as much to love as I did. Penny Dreadful plays with all of the big horror icons. Dracula, Frankenstein, and the Wolfman all appearing on the show. But the mad, monster, party doesn’t stop there. The show dabbles with many other figures from popular myth and Gothic literature. Wilde’s immortal hedonist Dorian Gray has featured into all seasons of the show and the second season handily dealt with occultism by introducing a coven of Satanic witches. We’ve also been treated to variations of the Bride of Frankenstein, various evil spirits, creepy talking dolls, and the Devil himself. Most of the monsters are created in a very old school manner. Make-up effects are heavily leaned on, most impressively was the very “Orlockesque” Master Vampire from season one. The show is a visual feast for monster fans who have likely found themselves starved by Hollywood in recent years. The show followed a rule of not losing the character behind any special effect. This is something that heavily pays off with most of the monsters that serve as regular characters. This is probably most true relating to Frankenstein’s Monster played Rory Kinnear. The Creature presented here doesn’t resemble Karloff’s neck bolted fiend and is probably not as physically imposing as you’d expect from the character. The make-up is rather more slight, not obscuring Kinnear’s features, working with them, instead of building over them. This approach allows the actor a full range of expression, so he gave a performance that is both heart breaking and when the rage is on him, very frightening. The show’s take on the Wolfman(Josh Hartnett) follows a similar pattern. In recent years most werewolves have been portrayed as either regular wolves or roided out CGI mutantations. This version of the character dials things all the way back to Universal’s Werewolf of London, giving us a toned down, but totally believable lycanthrope that fits in perfectly to the world he inhabits. The fact that you can still see Hartnett’s face under the pointed ears and fangs doesn’t make him less scary, if anything it makes him more terrifying because there is something still human there. And Hell Itself My Only Foe! Speaking of the Wolfman, let’s take a moment to zero in on everyone’s favorite werewolf. We are first introduced to the character as Ethan Chandler, an American gunslinger with mysterous past. He first feels like the show’s answer to Bram Stoker’s cowboy hero Quincey Morris, but we very quickly see that this sharp shooter has a lot of layers to him. By the time the second season reveals that his real name is none other than Ethan Lawrence Talbot, it feels more like a foregone conclusion than a surprise. He isn’t just a wolf man, he is THE WOLFMAN. Because of course he is, how could he be anyone else? Some of the details have been changed around, but the character remains much the same at his core. Surprisingly, despite the importances of werewolves in the pantheon of movie monsters, Talbot’s feral alter ego doesn’t show up right away. Instead we’re teased, told he is a man of “one of great violence and hidden depths.” His wolfishness coming out through his actions instead of sprouting fangs and claws. You don’t see a full werewolf transfomation to the last scene of season one, but I assure you it’s worth the wait. 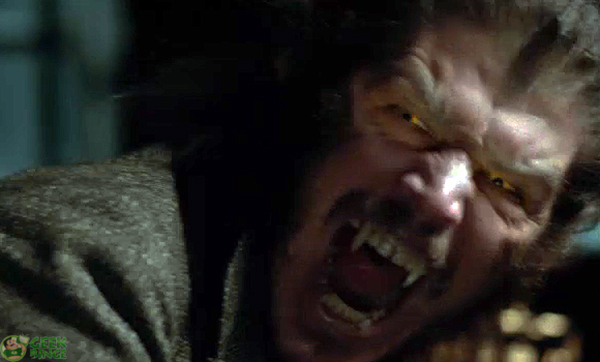 Penny Dreadful taps deep into werewolf mythology to construct it’s new take on the Wolfman. Although never name checked directly, the story of Thiess of Kaltenbrun is conjorred up from history, a Livonian man put on trial for heresy. His defense? That he was Lupus Dei, the wolf of God. It seems this werewolf served the Almighty instead of the Devil and was a fearsome enemy of witches and vampires. Despite being on the obscure side of werewolf mythology, this legend works well in the world of Penny Dreadful, allowing the show’s version of Larry Talbot to be cursed by God instead of the Devil. A short of holy hitman that is set up as the archenemy of none other than Dracula! Even though he’s nominally on the side of angels, our Wolfman is still cursed to be a murderer every full moon and doesn’t hold back when in a frenzy. Ethan is also hyper-sexual and apparently bi-sexual, as given from a passionate scene with fellow monster Dorian Gray. It seems after years of letting vampires have all the fun, this werewolf is out to single handily even the score on the bed post. Despite his lusty and promiscuous nature, Talbot developed deep romantic ties to both the fedliging Bride of Frankenstein, Brona Croft(in season one) and Eva Green’s troubled psychic Vanessa Ives(in season two, three). These relationships are presented as tense, tender, and as real as they can be despite the subject matter. His platonic friendships are also heart breaking, if not more so. In season two he bonds with badass butler Sembene, which of course doesn’t end well. But the build up is what counts, previously Sembene is presented as a mysterous man of few words. By trusting him with his hairy secret, Ethan causes the character to come out of his shell. It reveals things about Sembene and Ethan, that are men filled with deep loyality. That it ends tragically only ties it deeply to the modern cinematic tradition of werewolf lore. Of course none of this would work if Josh Hartnett didn’t do the heavy lifting needed. Harnett of course is a former teen idol and has always had a certain chirisma on screen. That being said, I feel like I’ve done him a disservice as an actor. I never would have imagined him being able to pull off a role as layered as this. The role of the Wolfman was of course originated by Lon Chaney Jr. and more recently played by Benicio Del Toro, with of course many,many varations protrayed by other actors ranging from Oliver Reed to Paul Naschy. Hartnett manages to stand on his own by giving us a version that is more sensitive and modern. Surprisingly, the central figure of Penny Dreadful is an original character, Vanessa Ives played by Eva Green. A forward thinking woman in Victorian London, Ives is burdened not only by psychic powers but ties to an ancient prophecy. Supposedly the “Mother of Evil” Ives is stalked and seduced by not only Count Dracula but Satan himself. When your dating pool features Dracula, the Wolfman, and the Devil, it’s no small wonder Ives is a little screwed up. What could easily been an intrusive of a new character into the realm of classic monsters, Ives ends up becoming a wonderfully gothic character in her own right. Largely due to the performance given by Green. The actress infuses Ives with a post-feminist sense of power. She is no mere damsel in distress, but the anchor that weights her misfit band of vampire hunters together. Vanessa is cut from the same cloth as Talbot or Frankenstein’s Monster. She’s tragic and wonderfully doomed from the moment we meet her. But as viewers, we don’t want her to be. Initially, I was concerned that show runner John Logan might have borrowing too heavily from Alan Moore’s take on Mina Harker in League of Extraordinary Gentlemen. The show takes great effort to give Vanessa depth and make her own character, not merely an homage to other works. Penny Dreadful loves classic horror in both literary and film form. Logan and company craft memorable versions of characters you’ve known your whole life, that feel both familar and fresh all at once. Dr. Frankenstein(played by Harry Treadaway) for example, is informed by previous versions of Frankenstein. You’ll find yourself seeing aspects of Colin Clive and of Peter Cushing, so the character feels classic. “Classic” is an important word here. The perfomances aren’t ripping off what other actors have done, but they are respectful to what came before them. This even spills over to the side characters. Bartholomew Rusk, a Scotland Yard detective charged with investigating the horrible murders commited by the Wolfman, has prostetic arm made of wood. This echos Inspector Krogh from Universal’s Son of Frankenstein in a way that is no doubt intentional. The characters however, are very different from one another. The show pays homage to what influenced it, while still forging it’s own path. Another set of secondary characters are Putney family, whom own a wax museum and employs Frankenstein’s Monster in the second season. Wax museums have of course been featured in many classic horror films and this side plot feels like it could easily be something Hammer Studios might have made in the 1960’s. But it’s with the youngest Putney,Lavinia that Penny Dreadful subverts your expectations. Intially you’re lead to believe that the Monster might have found a friend who won’t judge him, only to learn Lavinia is just as toxic as her two-faced parents. The classical nature of the various plots and side plots can even be used throw seasoned horror fans off the guard. It’s often done masterfully. Penny Dreadful ended with it’s third season and the death Vanessa Ives. So, as Universal moves into promotion overdrive for the Mummy and it’s Dark Universe spin-offs, it’s hard not for me to hope for the best. I love these characters and I want to continue to enjoy new tales of classic monsters. Some of the casting has been interesting, such as Russell Crowe as Dr. Jekyll or Javier Bardem as Frankenstein’s Monster. Still, it’s hard not for me to mourn for Penny Dreadful. It’s basically the same concept Universal is now trying to play off, but done with so much class and style. What could have been with more seasons of Penny Dreadful? Viewers were already teased Imhotep, the Mummy. We were given a wonderfully acted version of Dr. Jekyll but never his alter ego Mr. Hyde. So much promise snuffed out by the vicious TV ratings gods. Universal is moving forward from the Mummy towards new versions of Bride of Frankenstein and the Invisible Man. I can only hope they’ll learn from what the cast and crew of Penny Dreadful did so well. As for the show itself, if you are a fan of classic horror and you haven’t watched it before. Well, it’s high past time you took great relish in savoring each separate horror. It’s a world of gods and monsters worth exploring for the first time. Famous Monsters Con Roars Into Dallas!